In our previous post, we have described how to perform a standard installation of xrdp on Ubuntu 16.04. If you are a regular reader, you will have noticed that there is no changes since the previous release of Ubuntu (15.x). If you follow us, you probably also know that we like to perform a custom installation of xrdp using the latest version of the xrdp package (which is 0.9.0) that available on the Github web site. In this post, we will check that the current script we have developed to perform the custom installation is still working and provide the desired results. 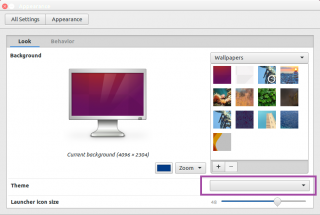 The xrdp standard installation process under Ubuntu 16.04 is working fine and you will be able to reconnect to existing session out-of-the-box. If you are like us, you might want to check the progress made by the team behind xrdp solution. To get the bleeding edge xrdp version, you will need to get it from the xrdp Github pages and compile it. If you want to understand what the script does, you can have a look at this location (Ubuntu 14.04 – Perform a custom XRDP Install (using X11VNC). If you copy/paste the script, you might encounter some issues because font formatting might be not maintained during the copy/paste operation. Please ensure that format is accurate before launching the script. Version 1.5 of the script will try to configure automatically the keyboard layout to be used during xrdp session. This is experimental. You can uncomment the lines about keyboard layout at the end of the script before the restart section. The script will also try to configure the system in order to enable multiple users configuration for xrdp. Do not hesitate to provide feedback on these small adjustements and let us know if this is working for you as well. echo "Extracting content of xrdp package..."
echo "Installing alternate desktop to be used with xrdp..."
echo "Symbolic links for xrdp"
You will need to copy/past the script into a text file in your home directory and save it as xrdp-install.sh. 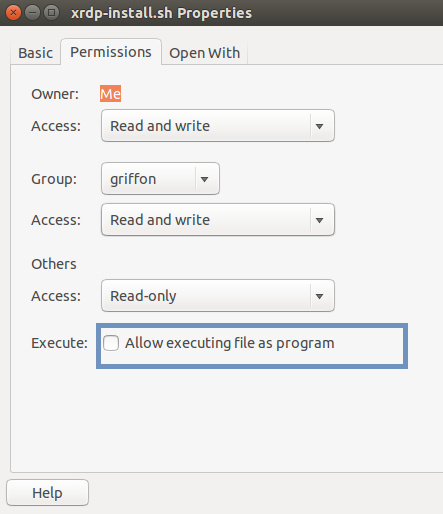 In order to be able to execute the script, you will need to mark the script as executable as well under you Ubuntu machine. 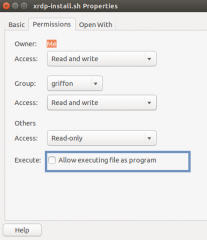 To make the script executable, you will perform the following action. You are ready to proceed with the custom xrdp installation. As mentioned before, we assume that you have internet connection and you will be able to download all the necessary packages needed to perform this configuration. When you are ready, you can execute the script by issuing the following command in the command prompt. In the login screen, if you are using a keyboard layout different than EN-US, you will need to check that the script has set the proper keyboard layout for the xrdp login dialog box. In the username field, check that your keyboard layout is set correctly. If this is not the case, go to the section below to perform a manual configuration of your xrdp keyboard layout. Finally, to test that reconnection to the same session works, you will need to open a first session, start an application and disconnect. Try to connect again, and if everything is working as expected, you should see the application you have started in your previous session. To test that, you can reconnect to the same session, open some applications and then disconnect. You should see that the applications that you have opened are still there up and running. Step 3 : create a copy of the km-0409.ini file into the same directory. 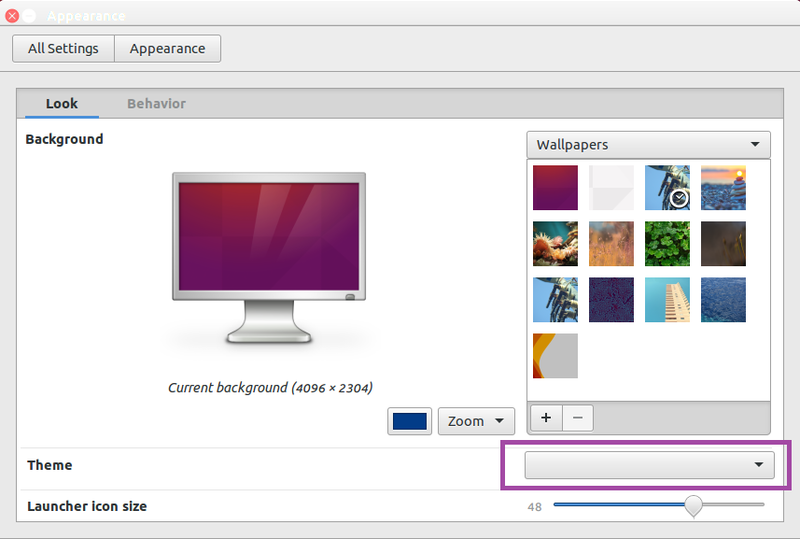 After installing the mate-desktop, you might notice that your ubuntu session (on the console not via xrdp) is a little bit different. You might see something like this. You can see that at the theme level, no option is selected. Select the default theme for Ubuntu (which is called Ambiance) or any other theme you would like to use. In this post, we have performed a custom installation of xrdp using an updated version of our little script. The process didn’t changed compared to Ubuntu 15.x. The same logic still applies. As mentioned, the script has been updated with some minor improvements and reached version 1.5. This version of the script tries to detect the keyboard layout in use and try to set it for the xrdp sessions. The previous script was also configuring the system for a single user connection. This version of the script change this setting and configure the system for multiple users by default now. Thanks again for your great guides. I’m trying to get this working with KDE, so I’ve replaced the mate-session commands with startkde as per your other guide on KDE. When I login, I get stuck at VNC error – problem connecting. I figured out I had x11vnc installed but not vnc4server installed. I am getting a gray screen after I login. Any ideas how to debug it? First of all, thank you for posting the articles. In the meantime, I’m using KDE as default for development, and try to connect from remote windows machine for coding. 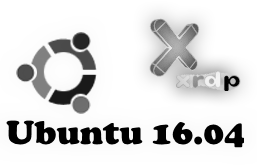 Would you mind if you can test with Ubuntu 16.04/14.04.2 for Xrdp? I have followed your instruction, but it didn’t work at all with KDE. I will update once I figure it out as well. I’m assuming that you have found out how to use the script and how to execute the script. Still, I’m figuring out how to enable KDE with Xrdp on Ubuntu 16.04. Another question is that How to use copy&paste between windows and XRDP session? Currently, I’m using mRemoteNG for RDP client in Windows. I CAN’T use copy&paste feature. Would you tell me what RDP client you are using for copy&paste? Thanks for the script, I use it on every machine I install. There is one minor problem. The error is logical, as i do not have any display connected. xrdp works after that, except the keyboard layout – obviously. in the rdp desktop i use virtual-manager and this one use some vnc to control the virtual machines and there i got no keystroke within the RDP. I also tried to rsync the user from a working system, no luck. just empty layout and empty model. On the console desktop everything ist changeable but has no effect. here the results of my investigation. If the above mentioned error remains – just copy a correct km-0409.ini and replace in the virt-manager the spice interface with the old vnc protocol. After that typing into the windows of the virt-manager works in the rdp session. Thanks again for the great script !!!! Before trying this script, i’ve tried the ‘easy way’ installation of xrdp, for which i’ve also posted questions. Many thanks for your magic script. The error i mentioned in the last post has been solved by your FAQ. Thanks a lot for this amazing Blog. I’ve struggled with remote login ubuntu for few days. I got it working using this script however running apps still returns “Segmentation fault (core dumped)” in the mate environment. I can run chrome however… some apps are working.. is there any log I can provide you? What have you installed differently than the post describe ? We cannot reproduce your error. can this script be used if i have xfce4 installed already? if so how since i can only use xvnc currently. Hi I made a vmware ubuntu vm using xubuntu and let the script install as default changing nothing but when I try to connect ot the ip of the machine with rdp I can’t it has it’s own ip and is bridged so it should be able to and it starts with the default 192.168 so why can’t I connect no static ip maybe? after several tries I still cant get the ‘Xvnc-sesman-…’ in my drop down menu of the xrdp start screen, and thus no connection. PS: before I also had the standard installation of xrpd for ubuntu 16.04 running but it kept closing the windows of the applications directly after starting. No clue what the problem could be…. The script was tested up to xrdp 0.9.0, we will need to check if xrdp version 0.9.1 brings news stuff that might break the installation script. Ok, thank for the info… we never had to install this package on Ubuntu desktop…However, on Ubuntu Server, we had to install indeed additional packages..
Hi, thanks for the great article; unfortunately it doesn’t seem to be working for me. I just reinstalled Ubuntu 16.04 the other night, so brand new installation – the script ran fine without any errors, but when I went back to my Mac (running Microsoft’s official rdp client), it comes back almost immediately with no connection. I made sure my router has port 3389 open to my Linux box, but then I checked netstat -an | grep “3389”, and nothing comes back – maybe the service isn’t running? How can I check on the Linux side?